Many beginning writers and editors benefited from a crusty old editor’s brisk maxims about the craft. If you want to be reminded of those days, look inside. If you want to learn those brisk maxims, many of them are collected here. 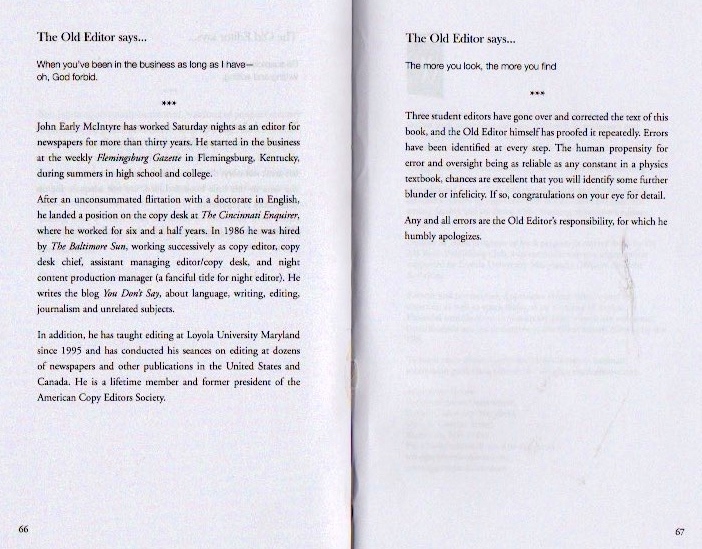 And if you aspire to become a crusty old editor, this is the handbook. This is not the world of Will Strunk, ± E.B. White, but a world of hard practicalities (p.12: “If your mother says she loves you, check it out”; p. 34: “Get the names right”; p. 35: “If you are not possessed of a perpetually filthy mind, you are ill-equipped to edit”; p. 63: “Don’t keep the good liquor where the staff can get at it”) set in a moral universe populated by the writer, the reader, and the editor (p. 19: “The reader doesn’t care how hard you worked on that story”; p. 23: “Reporting ain’t stenography”; p. 25: “Always honor the writer’s intentions. If they can be discerned and make any sense”; p. 26: “You can’t fatten poor stock”; p. 30: “Giving a reporter a thesaurus is like giving a toddler a loaded handgun”). p. 44: “Coveted” is as empty a piece of padding as “prestigious.” Thou shalt not covet. p. 46: The next time you use “to die for” in copy, we can make that happen. p. 47: “If you write “in the wake of” something, that someting had better be a boat. p. 48: Kid, there are two places you want to stay away from when you write: gritty streets and leafy suburbs. p. 49: If you cover cops, try not to write like a cop. You know, “ejected from the vehicle.” Like that. I neither miss nor long for that insular white, evangelical Protestant, anti-intellectual culture I grew up in [in the hardscrabble Appalachia of Kentucky], or its many bigotries, genteel or otherwise. There are people — may they fry in the sulfurous flames of hell — who exult in finding typos in the work of writing professionals (like John or, in fact, me), so that they can accuse us of hypocrisy, of not knowing how to spell, or of manifesting contempt for our readers. Inadvertent errors are a fact of life. Human beings are not designed for error-free performance — but they are designed to generously (and silently) disregard errors, to empathetically gauge intentions amidst a certain amount of noise. A wonderful social ability that in fact makes it extremely difficult to detect errors and root out every one. When you speak or write in bursts of enthusiasm or inspiration, in the flow, you’re probably going to make a fair number of errors. So with John — I’ve caught some of them in the first versions of his postings — and, big time, with me. In particular, my poor nerve-damaged, arthritis-inflamed fingers regularly don’t hit keys with enough force to register, so my typing is riddled with dropped letters. There’s really no solution here: I can set the keys to register with less force, but then my typing is riddled with extraneous letters; or I could try to master a technology for voice-operated texting, but that just brings in a whole fresh set of errors; or I could submit to spellchecking programs that bring the flow of my writing almost to a halt. So I muddle along and do the best I can to find and fix the dropped letters, but some get through — as in McIntyreOldEdtor instead of McIntyreOldEditor (I eventually noticed it, but by then the filename was stored in three different places, so I just let it go). 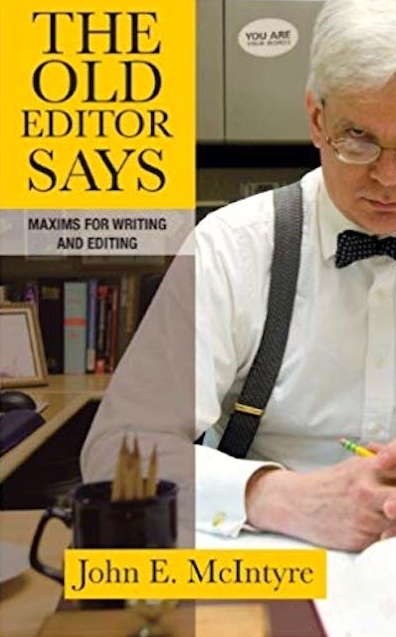 In any case, as John says on p. 10: “If you’re your own editor, you’re working without a net.” Sadly true, but many of us don’t have staff, so we’ll end up depending on the good will of our readers. This entry was posted on February 2, 2019 at 11:04 am and is filed under Books, Errors, Typos, Usage advice, Usage attitudes, Writing. You can follow any responses to this entry through the RSS 2.0 feed. You can leave a response, or trackback from your own site.